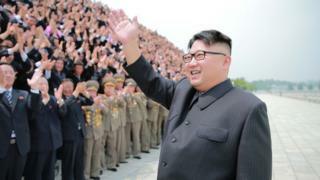 The US has sanctioned North Korean leader Kim Jong-un for the first time, accusing him of human rights abuses. A statement from the US Treasury named Mr Kim as directly responsible for violations in his country. Ten other top North Korean officials have also been blacklisted. There has been no response yet from the North Korean government. The measures freeze any property the individuals have in the US and prevent US citizens doing business with them. North Korea is already under an extensive sanctions regime for its nuclear activities but analysts see the latest move as an escalation of US efforts to isolate the nation. "Under Kim Jong-un, North Korea continues to inflict intolerable cruelty and hardship on millions of its own people, including extrajudicial killings, forced labour, and torture," the Treasury statement said. The sanctions were announced to coincide with a State Department report documenting abuses in North Korea. It estimates that between 80,000 and 120,000 prisoners are being held in North Korean prison camps where torture, sexual assault and executions are routine. State Department spokesman John Kirby admitted the sanctions were unlikely to deter Mr Kim. "But that doesn't mean this still isn't the right thing to do and it doesn't mean that it still isn't the right thing for us to continue to pursue," he added. The US has imposed sanctions against other heads of state before, including Syria's Bashar al-Assad and former Libyan leader Muammar Gaddafi.